We’ve seen a lot of Brett Kavanaugh’s blinking face in the last few weeks, but today is the first day we actually saw and heard Christine Blasey Ford, who has dared challenge the carpool dad and Supreme Court nominee. In the two blurry photos that circulated online before today, her eyes had been guarded behind sunglasses; what she sounds like, we finally are learning during this afternoon’s televised Senate hearing. I don’t know if it’s intentional, but our clearest image of her face had previously been of Blasey as the girl she was when, as she just testified, she was locked in that room with Kavanaugh and his friend Mark Judge: baby-faced, Farrah haircut, mouth slightly ajar. It strikes me that Republicans are scared of Ford because she is essentially a class traitor. Two of the accusers whose names we know, Deborah Ramirez and Julie Swetnick, were immediately marked as outsiders by the circle of old school friends and Republican operatives that closed around Brett Kavanaugh from the start. Deborah was, the Times reported, “the daughter of a telephone company lineman and a medical technician” — nearly a townie, half Puerto Rican, doing her time scrubbing dorm toilets and serving her classmates food while Kavanaugh was, according to his roommate, coating his dorm bathroom in vomit. Julie Swetnick was worse, by the lights of Kavanaugh’s Georgetown Prep defenders: “Never heard of her. I don’t remember anyone from Prep hanging out with public school girls, especially from Gaithersburg.” Talk about incriminating yourself. Women like Ford are the ones who have mostly raced to protect Brett Kavanaugh — not to mention Donald Trump — because admitting that there was something rotten in their culture would implicate them, too. 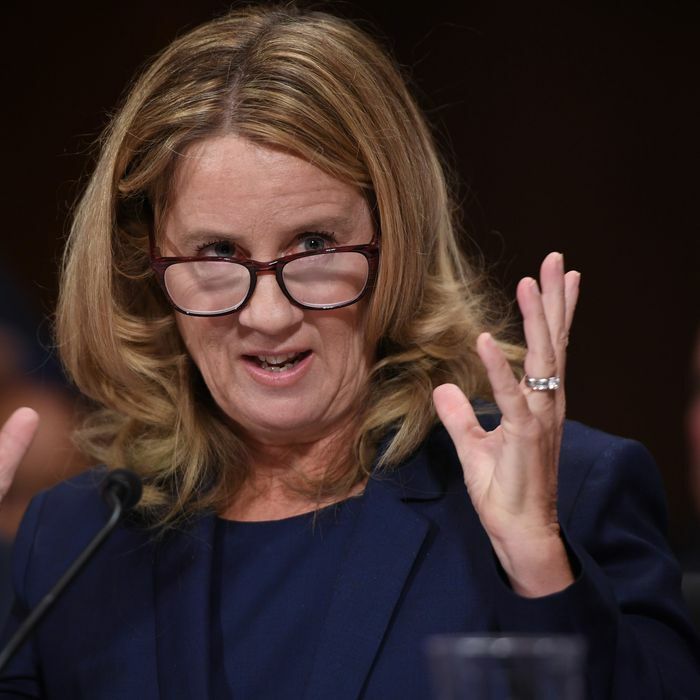 What makes Ford different, it seems, is that she is ready to tell the truth that even the white woman on the pedestal is ultimately doomed to subordination, and if she gets in the way of the plan or breaks the code — well, she’s on her own.